When we are getting ready for our Christmas parties this year, no doubt we will fall back on the LBD. But this season why not go for something a little bit different when you are doing a last minute trolley dash before your Christmas do? Miss Selfridges has two great twists on the black party dress – except these aren’t so little and one isn’t even a dress. Which girl are you? 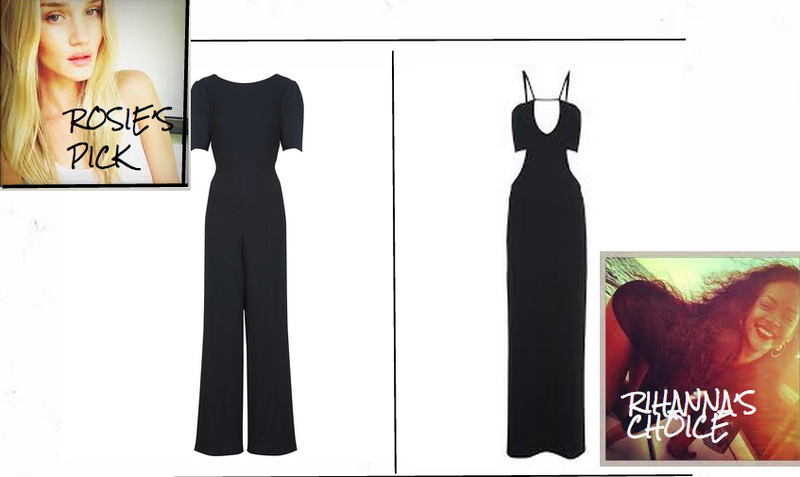 Sleek and elegant in a timeless floor length gown or something a little more unexpected and trendy in the jumpsuit? I think Rosie Huntington-Whitely would look amazing in the jumpsuit while the dress is definitely something Rihanna would go for. Both outfits would look great with a dark lip, glossy hair and statement earrings. Tah-dah Christmas dressing sorted. This entry was tagged jumpsuits, miss selfridge, outfit ideas, party style, rihanna, rosie huntington-whitely. Bookmark the permalink.